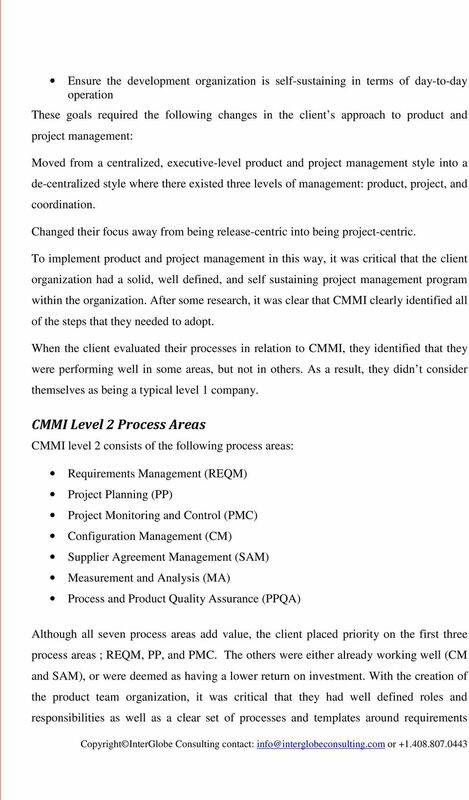 Download "How to use CMMI to bring your project management process to the next level A CMMI Implementation Case Study"
3 definition and change control. REQM process was fully adopted and executed with great success. 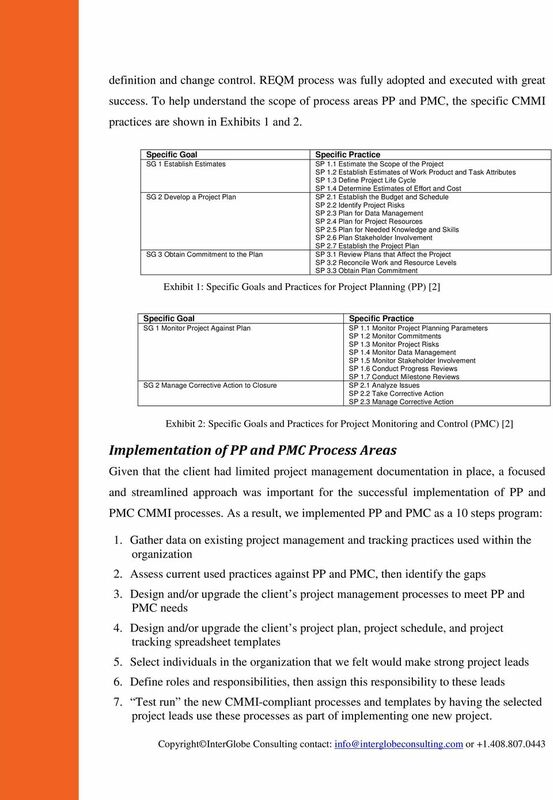 To help understand the scope of process areas PP and PMC, the specific CMMI practices are shown in Exhibits 1 and 2. Specific Goal SG 1 Establish Estimates SG 2 Develop a Project Plan SG 3 Obtain Commitment to the Plan Specific Practice SP 1.1 Estimate the Scope of the Project SP 1.2 Establish Estimates of Work Product and Task Attributes SP 1.3 Define Project Life Cycle SP 1.4 Determine Estimates of Effort and Cost SP 2.1 Establish the Budget and Schedule SP 2.2 Identify Project Risks SP 2.3 Plan for Data Management SP 2.4 Plan for Project Resources SP 2.5 Plan for Needed Knowledge and Skills SP 2.6 Plan Stakeholder Involvement SP 2.7 Establish the Project Plan SP 3.1 Review Plans that Affect the Project SP 3.2 Reconcile Work and Resource Levels SP 3.3 Obtain Plan Commitment Exhibit 1: Specific Goals and Practices for Project Planning (PP)  Specific Goal SG 1 Monitor Project Against Plan SG 2 Manage Corrective Action to Closure Specific Practice SP 1.1 Monitor Project Planning Parameters SP 1.2 Monitor Commitments SP 1.3 Monitor Project Risks SP 1.4 Monitor Data Management SP 1.5 Monitor Stakeholder Involvement SP 1.6 Conduct Progress Reviews SP 1.7 Conduct Milestone Reviews SP 2.1 Analyze Issues SP 2.2 Take Corrective Action SP 2.3 Manage Corrective Action Exhibit 2: Specific Goals and Practices for Project Monitoring and Control (PMC)  Implementation of PP and PMC Process Areas Given that the client had limited project management documentation in place, a focused and streamlined approach was important for the successful implementation of PP and PMC CMMI processes. As a result, we implemented PP and PMC as a 10 steps program: 1. Gather data on existing project management and tracking practices used within the organization 2. Assess current used practices against PP and PMC, then identify the gaps 3. 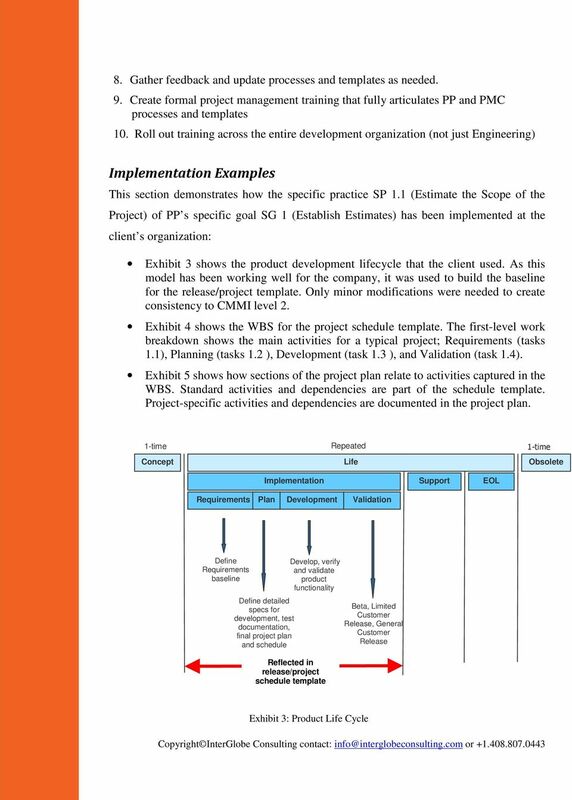 Design and/or upgrade the client s project management processes to meet PP and PMC needs 4. 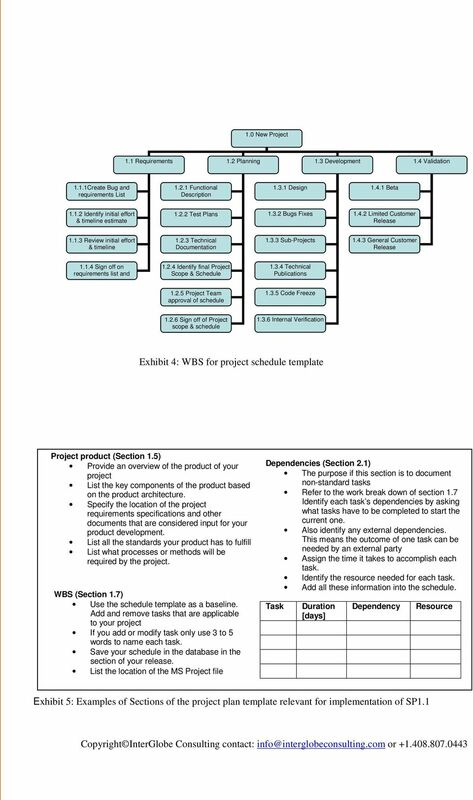 Design and/or upgrade the client s project plan, project schedule, and project tracking spreadsheet templates 5. Select individuals in the organization that we felt would make strong project leads 6. Define roles and responsibilities, then assign this responsibility to these leads 7. Test run the new CMMI-compliant processes and templates by having the selected project leads use these processes as part of implementing one new project. 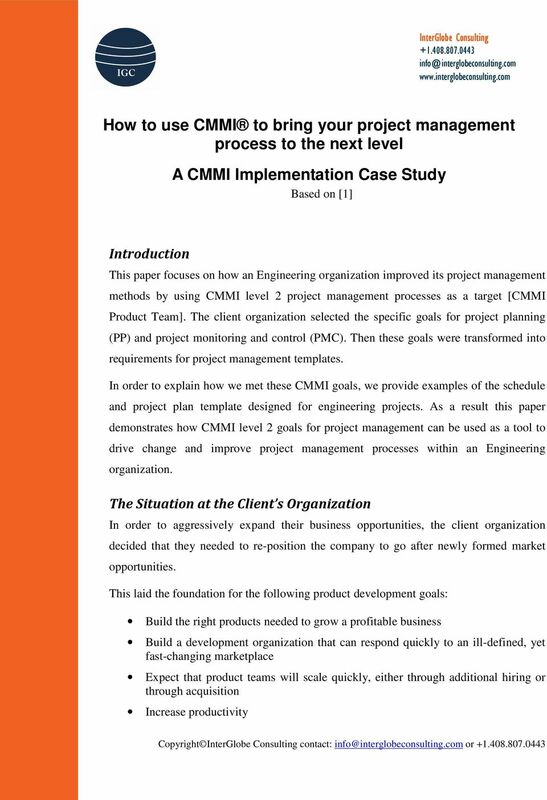 6 Outcome By leveraging the strong foundation of experience, process, and structure provided by the CMMI maturity model, the client made significant progress in transitioning to his new product development model. After the implementation of PP and PMC processes the client felt that the organization had a very strong infrastructure in-place. Product teams were ramping up and were taking on responsibility for product business decisions. Projects and releases were planned and managed proactively through the steps of the product development lifecycle. CMMI s project management (PP and PMC) were in place and became part of daily routine. 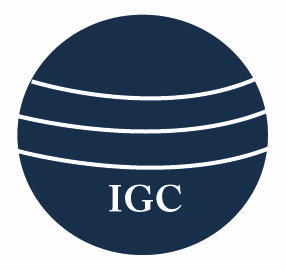 The introduction of the project lead role empowered the project teams to resolve issues and make decisions quicker in order to achieve project goals and deadlines. Because of the distributed project leadership function, the client successfully removed the highly anticipated bottleneck in product and project management. As a result of becoming a project driven organization, the client observed a significant increase in productivity (product content) as well as increased flexibility in reacting to customer and market conditions. 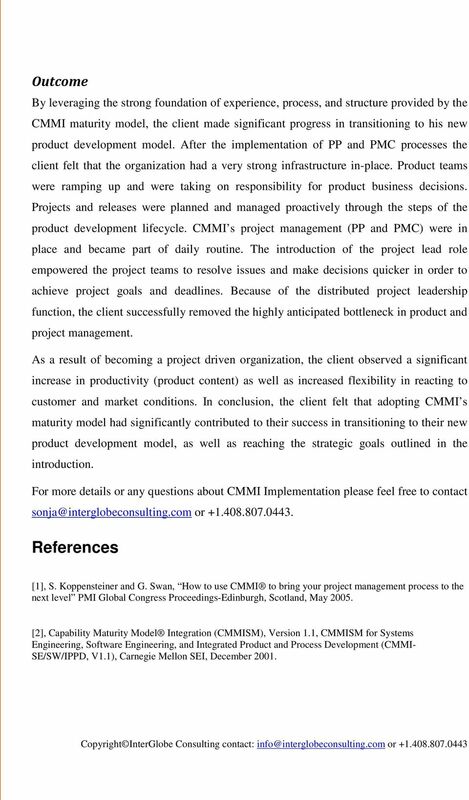 In conclusion, the client felt that adopting CMMI s maturity model had significantly contributed to their success in transitioning to their new product development model, as well as reaching the strategic goals outlined in the introduction. For more details or any questions about CMMI Implementation please feel free to contact or References , S. Koppensteiner and G. Swan, How to use CMMI to bring your project management process to the next level PMI Global Congress Proceedings-Edinburgh, Scotland, May , Capability Maturity Model Integration (CMMISM), Version 1.1, CMMISM for Systems Engineering, Software Engineering, and Integrated Product and Process Development (CMMI- SE/SW/IPPD, V1.1), Carnegie Mellon SEI, December 2001. Manage the acquisition of products from suppliers for which there exists a formal agreement.